In the past, deep tooth infections often lead to the deeply infected tooth being extracted. Luckily, with the help of modern dental technology, root canals can remove infections and help you keep your natural teeth. Root canal therapy requires one of our team to carefully remove infected and decayed pulp in the effected tooth. Then, once the diseased tissue has been removed, our team will carefully clean your tooth and then professionally seal your tooth to help protect it. For additional protection, many teeth require a dental crown. Our dental crowns are made of beautiful porcelain, that functions to protect and beautify your tooth. Abscesses | Having abscesses forming around the bases of teeth usually means that your teeth are fighting off a deep tooth infection. Root canal therapy can help your abscess or abscesses be taken care of, and get your oral health back on track. Swelling | If you have swelling that just won’t go away around one of your teeth, there is a possibility that you’re fighting a tooth infection. If the infection is deep enough, a root canal may be necessary. Extreme Sensitivity | If you have a tooth that is extremely sensitive, it doesn’t necessarily mean you have a tooth infection, however if it is combined with these other symptoms and just doesn’t go away you may need root canal therapy to help. Chronic Toothaches | If you have a toothache that persists, and even becomes severe, it most often means you have a deep tooth infection that your tooth is battling. 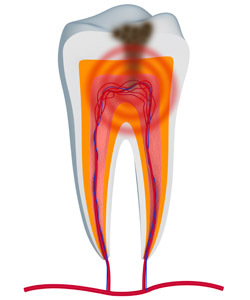 Root canal therapy can remedy the tooth infection, and help preserve your natural tooth. Our team is experienced in providing this treatment to our patients that need it, and will do their very best to give you a pleasant, positive experience. Root canal therapy can make a difference in the overall quality of your oral health, and we have seen it help improve the lives of many patients. Are you concerned that you may need a root canal, or do you have questions about root canal therapy? Please contact us today!